Is the Industar an Elmar Copy? Not really. The collapsible Industar 22/50 resemble the Elmar in barrel design. But optics and other internal features differ. The Industar is more like a Tessar– a four element triplet. 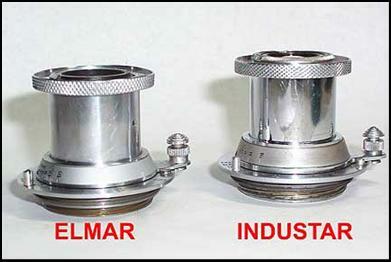 The Elmar is also a four element triplet anastigmat. The earlier Industar used by the FED resembles the Elmar in dimensions and both use a tiny lever to set the diaphragm. Industar 22/50 use a (more convenient?) ring in its place. A similar setting ring is also found in the collapsible Tessar for the Contax rangefinder. Most soviet lenses were derived from Carl Zeiß designs. Another feature which makes the Industar more Tessar than Elmar is the position of the diaphragm blades. In the Elmar (the 50mm versions), the iris is behind the first element. In the Industar, the iris is placed behind the second group/element. Almost all triplet-anastigmats follow the latter arrangement, including the 90mm Elmar. 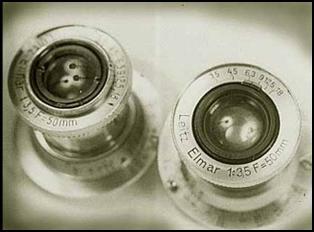 Two „Elmar“ lenses. The real Elmar is a prewar, uncoated (note the „white“ sheen of its glass) example which came with a Leica III. The other Elmar had been an Industar before it was relabeled, and came with a Zorki which had been relabeled as well, as a Leica. The Industar is coated (note the blue glass) and uses a ring to set the diaphragm. See arrows pointing to this and the setting lever on the Elmar. Both lenses are set to „f-6,3“ The engraving on the fake Elmar is also very rough. Optically, good Industars are as good as any Elmar or Tessar. I have seen how some of my coated Industar FED lenses outperform this uncoated Elmar. 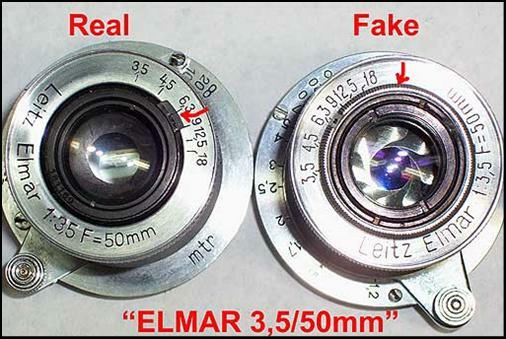 FED and Zorki are often found with collapsible „Industar” lenses patterened after the Leitz „Elmar”, left. Formula-wise, they are closer to „Tessar”. Performance wise, a well-adjusted Industar can be as good as the Elmar. But for the Industar to work correctly, it has to be correctly adjusted, which unfortunately, isn’t the case for many of them. The FED-50, Industar-22, and Industar-50 resemble each other and differences in optical performance are almost nil. The real one is on the right!